But since I sort of made it up and perhaps tend to be overexcited thus somewhat incoherent when talking about it, I have had a hard time describing this dish to others and, consequently, convincing them how good it is – Even to my sister, who is actually married to an Italian (“So… it’s basically cabbage soup?” “No, it’s more like gratin. And bread becomes like French toast, but it’s savory and baked” “So it has eggs in it?” “No, it’s soaked in broth. And I put cheese on top. It’s soooo good! Make it. Make it TONIIIIGHT!! !” “Uhh… Okay…”). So let me try to set the record straight – With the bread fluffy with all the broth it soaked up while baked and crispy on edges, tender and flavorful vegetables and bubbling cheese on top… I would say it’s something between onion gratin soup and bread pudding with a decidedly Italian twist. Another reason why it’s hard to define what it is (but also why it has become my favorite) is that absolutely no precision is required in terms of ingredients and preparation, as you see in the recipe below. I have made this with chickpeas instead of white beans and used different combination of cheese depending on what I had in refrigerator at that time for equally successful results. I usually use Swiss chard for greens since I liked my initial version, but traditionally Zuppa di Cavolo uses Tuscan (dinosaur) kale and I can imagine it would be fabulous, too. Aside from my challenges (and hopefully this post will help persuading my sister), it’s a perfect one-dish meal that is super satisfying and comforting – With this and a glass of chilled white wine, I’m all set to get through the rest of winter. Preheat the oven to 325 degree. Thinly coat the gratin dish with olive oil. Boil the broth in a large pot. Add Swiss chard and beans, reduce the heat to medium-low, cover and cook until it is tender. Place a half of bread pieces to cover the bottom of the dish. Ladle soup over bread until bread is submerged. I like the final results to be not too soupy, so try not to pour too much. You want bread to soak up the broth to get fluffy but not swim in it. Ladle the half of cooked Swiss chard on top of the bread. Scatter half of Asiago cheese slices over the chard. 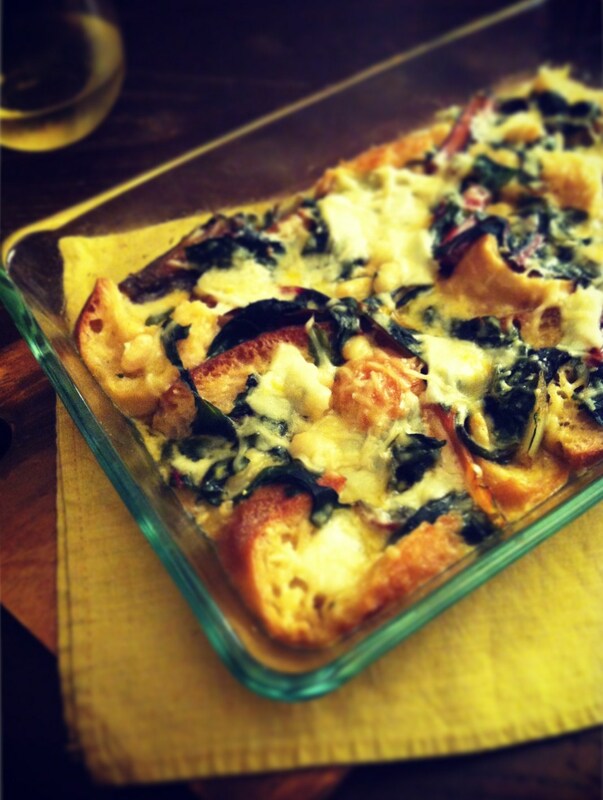 Repeat the layer of bread, soup, Swiss chard, ending with Asiago cheese. Sprinkle Parmesan cheese to cover the surface. Place in the oven and bake for 30 minutes until cheese is crusty on top. Serve piping hot.